BlackOut Design’s talented Art Director, Phil Barket, generously donated his time to create the poster for the “Lords of Drawtown: Drawcore Skatepark Annual Block Party”. Phil was approached by fellow Marywood instructor and artist, Ted Michalowski, to participate in this positive community event. Lords of Drawtown will feature live mural paintings by Ted and students, skateboard competitions, music and more on July 16th and 17th. 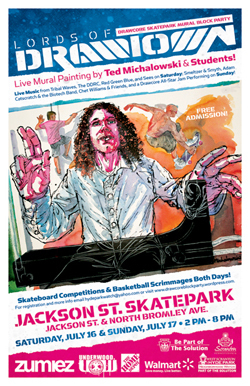 This will be the first annual block party at the Jackson Street Skatepark. Phil created a dynamic design to draw attention to this summer event all on his own time. We are so proud that a member of our team gets to display his art in such a positive manner.